The Greenland has 3 piece hinged construction, a very full profile, PVC tapered tips, hard needles, and comes in a lovely medium green color. 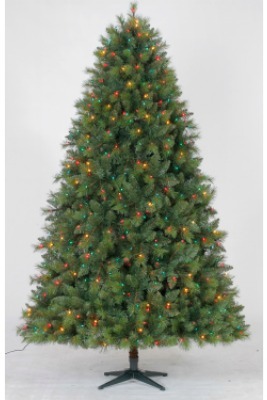 Featuring Quick Set construction (wiring inside the trunk and ready for use) and Perfect Shape technology which means it uses memory wire branches that are pre-shaped so your tree comes out of the box looking lush and full and is ready in only five minutes. Comes with incandescent mini lights and a green metal stand.